Discover the wildlife and natural wonders of the Yucatan Peninsula on this full-day tour from Playa del Carmen. 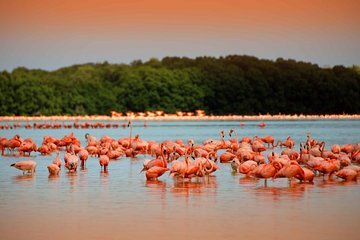 Admire the stunning pink-colored lagoons of Las Coloradas, visit the Crododile Sanctuary, and cool off with a swim in the Ek Balam cenote. Finally, cruise through the mangroves of the Rio Lagartos and look out for birds such as flamingos, cormorants, ospreys, and pelicans.